Pre-SUP and kayak lesson with the Bootmobile! Even if you're a passionate outdoorsperson with a long list of favorite activities, it's always fun to try something new. And what better way to expand your outdoor activity repertoire than with a company that truly believes time spent outdoors is fundamental to happiness? Earlier this month, I had the chance to try stand up paddleboarding (SUP) for the first time and spend a few hours kayaking with L.L. Bean's Outdoor Discovery Schools. The Schools, the infamous Bootmobile, the Outdoor Discovery Tour, and partnerships with organizations like Philadelphia Parks and Recreation are all meant to further L.L. Bean's mission to get more people outdoors. It's a mission not many retailers have and act on, and seeing the passion behind the mission made our day even more enjoyable. Our group, including Green Philly Blog's Julie Hancher, met at beautiful Nockamixon State Park just over an hour outside of Philadelphia one one of the hottest days we've had this summer so far. The weather made the idea of spending an entire day on the water even more appealing. Fishing and boating are also popular activities on Lake Nockamixon, a 1,450 acre man-made reservoir with park land on both banks. After a quick lunch and a chat with the captain of the Bootmobile, instructor Brendt gave us a quick dry land lesson in SUP technique to start the afternoon's activities. 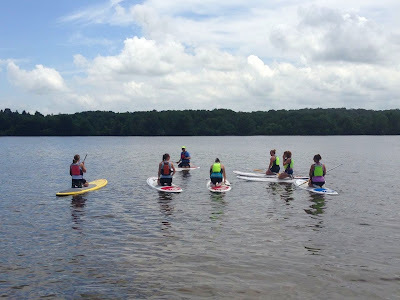 After donning life jackets, grabbing boards and paddles, and lathering on the sunscreen we headed to the lake to put what we'd learned into practice. I quickly learned that as in most outdoor pursuits, the more tense you are, the harder it is to get up and stay up on your paddleboard. The more I let my legs relax, the more solid I felt. After a bit of paddling around, Brendt started a game of catch with the group to make it easier for us to relax and to help take our focus away from staying balanced. Overall, it was a blast. I didn't take any unintentional tumbles into the lake, (which might mean I wasn't trying hard enough! ), and I'd love to try SUP in the ocean. After an hour of SUP fun, we paddled back to shore and traded our boards for recreational kayaks. Instructors Brian and Justin taught us proper paddling technique along with a complete lesson in the ecology and history of Lake Nockamixon. Turns out it's such a popular fishing spot because it's what our instructors called a healthy lake. Between the beautiful foliage on the banks to the half-dozen great blue herons we saw fly by, I can see why it's an idyllic year-round destination. Our nearly three hour excursion flew by and I found myself looking up other opportunities for recreation with L.L. Bean's Outdoor Discovery Schools as soon as I got home. 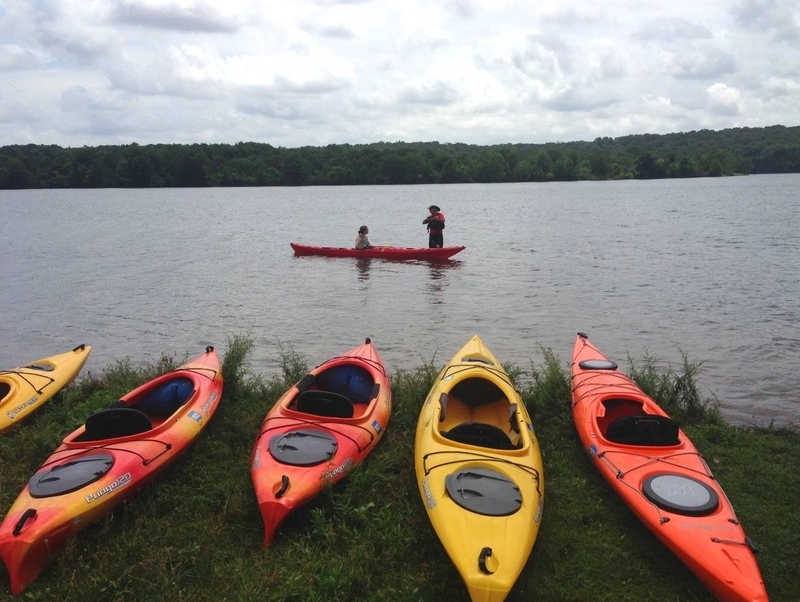 Outdoor Discovery Schools courses are run out of local L.L.Bean retail stores, and in the Philadelphia area, these include Center Valley, PA, King of Prussia, PA and Marlton, NJ. I've got my eye on another SUP session, potentially even fly casting. 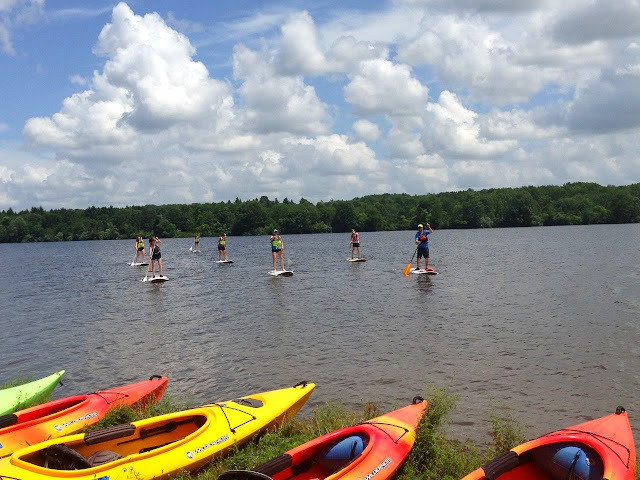 Have you tried SUP or recreational kayaking? If you have, what tips do you have for beginners? Have you tried SUP on the ocean or flat water? If you haven't tried either, take a look on L.L. 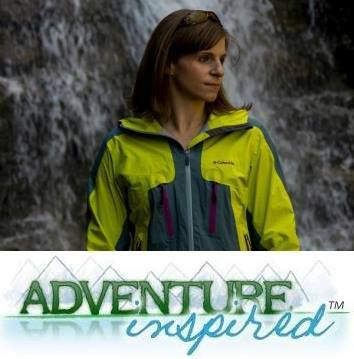 Bean's website for an Outdoor Discovery School near you! Also, visit the Green Philly Blog for Julie's perspective on the day. Many thanks to L.L. Bean for providing our complimentary gear rentals, food, and talented, passionate guides for the excursion. Thanks for sharing! Great point on the tense vs relaxed for SUP-ing... I noticed that I did better when I was relaxed as well. I had a great time with you and your crew, Julie! I'm loving the content on Green Philly Blog too, so much good stuff and it's all relevant to my life. Looking forward to keeping in touch! I'm dying to try this next time I visit my sis in Hawaii! 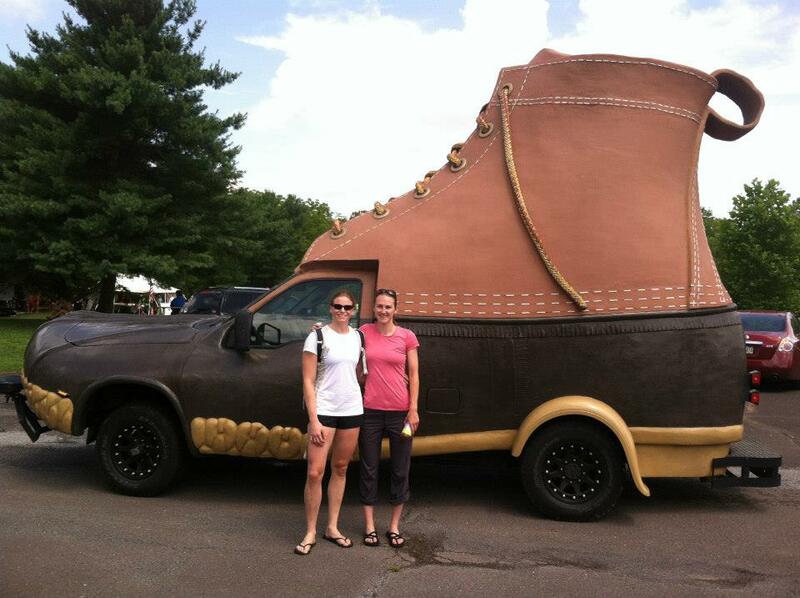 And for the record, that boot mobile thing made me laugh-- when I lived in Maine, EVERYONE wore those LL Bean boots! After reading about so many people trying this I really want to do it! And I want to ride in that boot!! I've been eyeing up intro SUP classes for a while now... this LL Bean class sounds great! 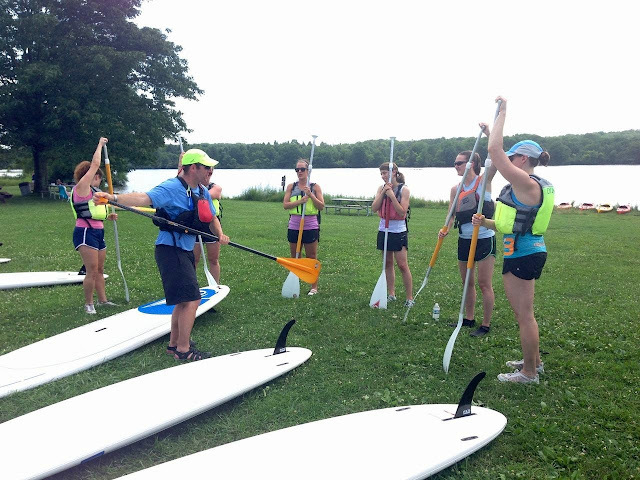 Do you think it would be easier to learn on flat water vs. the ocean? I definitely think it would be easier to learn on flat water. It gives you time to master paddling technique and balance before the waves throw a whole new variable into the mix! But as this was my first time, I'm not sure what it's like to SUP in the ocean. I'd say try it wherever you can! Just paddling from the surf boards would be a challenge for me. Great article!